Industry-specific lead generation has always been a hot topic and has gained speculation as there is a persistent question regarding the kind of elements that goes into the web-presence of various business sectors. All industries have their own specifications as far as presenting their products and service is concerned. An online promotion vehicle for a photography-based business could be complicated and also very attractive. The best of your artistic works and expertise needs the best online platform for promotion. So, along with lots of display space, you also need to ensure that your landing page is successfully able to acquire leads by grabbing attention and generate required action at the right places. Your prospective clients need information through your landing page, something that will set up the scene for all future correspondence. Your landing page will become the visual storefront. The visuals will play the role of the collage that is at display at studios and your textual content will play the role of a salesman. This landing page will completely control the awareness stage of your prospects and help you in pushing them further down the conversion funnel to make them your customers. In this article you will come to know about the best practices that you could implement or check out for in the landing pages that you want to promote online to garner eye-balls. The brain processes images 60,000 times faster than text. 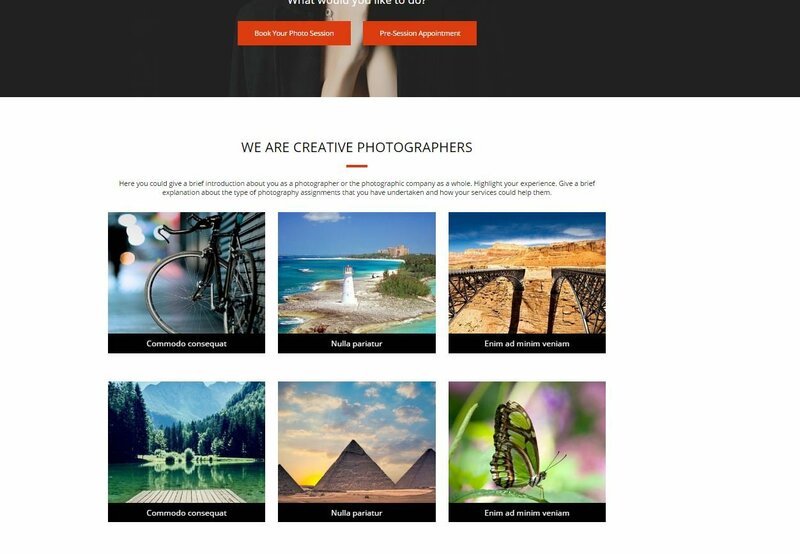 Photography business completely consists of attractive visuals and you have to make sure that you have a collection of some awe-inspiring visuals to display on your landing page to at once spark interest. The reason why this element comes at the top of the list is because your photography landing page is incomplete without visuals. Your landing page should have at least 2 dedicated sections to display stunning visuals. The banner is where it all will begin. Without striking the right chord over here, there are more chances that all the efforts in the upcoming sections will go in vain. This sections comes above the fold and displays your best visuals and calls-to-action (more on that later) to entice your audience and push them to take your desired action. Headline will set the tone for all the upcoming communications ahead on the landing page. Ensure that it is attention-grabbing, clear, and promises only what is to be delivered. This will be the first crucial language on your page. With photography as the main theme, make sure you make a punch that is relevant to your business. Being in the photography-based business, you are perhaps aware about what your potential customers ask for before closing the deal. These interactions could play a valuable role in generating content for your landing page as you will be giving answers to most of the questions directly, so that your prospects are fully confident to move ahead and turn into your leads. Calls-to-action play the most crucial part when it comes to any lead generation asset. However, there is more than a mere, “Click here,” or “Get more details” in the case of a photography landing page. Your prospects might be looking to book an appointment with a photographer, or get a quote for certain photo-shoot specifications. In such a case, you should have calls-to-action that are customized to perform for this particular landing page. You could insert calls-to-action at 3-4 places around the landing page. Your prospects while looking out for the best photographer or related services provider, might want to get more details about how they could carry out a photo-shoot. They may even need a quote to know where their budget is heading. Thus, you need a form with all the right elements relevant to your business. Some of the most essential fields in any form are “Type of event,” and “Venue” to give the photographer a basic idea about the kind of preparations they will have to make. With this section you could display some of your prominent clients with whom you have worked. The major benefit with this section is that it straight away sets up the expectation. You build trust and attract more opportunities to get potential leads. Nothing beats real reviews from happy clients as they at once build trust within your prospective clients. 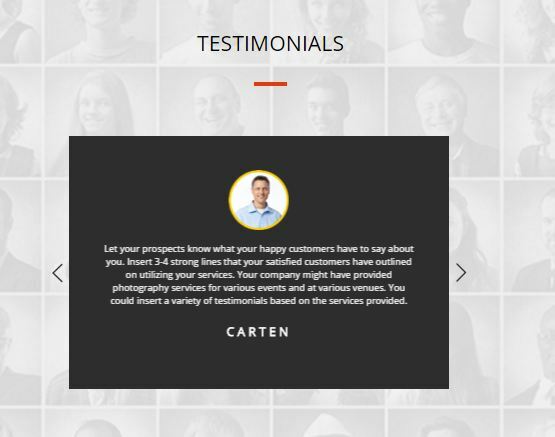 Ensure that you gather testimonials from satisfied clients and present the same in the dedicated section. This section could talk about how your expertise helped in capturing the best of moments. Maybe your lighting skills are commendable followed by your quick-turnaround-time. There could be a dedicated section to showcase your portfolio, which carries various sections including wedding, birthdays, baby-shower, modelling, filming, and more. With this section you could display multiple pictures for various sections to show your expertise in various niches. A section dedicated to showcase the awards and accreditations to you as a photographer or the company could play a big role in setting up the expectations. A reinforcement bar is something that displays the USP of your services towards the end of the landing page with a strong call-to-action. Here you could even insert a single statement to let others know what you are worthy of. With every industry having its own version of landing page, a photography business couldn’t be left behind. There are many reasons that you should know the various elements of online promotion so that you could shape them into your specific business category to have a fully-customized landing page. The elements that we have mentioned above are the most essentials one and you simply couldn’t launch the landing page without these.